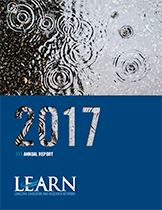 The Lonestar Education And Research Network (LEARN) is a consortium of 41 organizations throughout Texas that includes public and private institutions of higher education, community colleges, the National Weather Service, and K–12 public schools. The consortium, organized as a 501(c)(3) non-profit organization, connects its members and over 600 affiliated organizations through high performance optical and IP network services to support their research, education, healthcare and public service missions. LEARN is also a leading member of a national community of advance research networks, providing Texas connectivity to national and international research and education networks, enabling cutting-edge research that is increasingly dependent upon sharing large volumes of electronic data. LEARN's Vision: LEARN will be the most efficient and effective enabler of research, education, healthcare, and public service communities in Texas using technology and shared services. LEARN & OneNet to Be Connected to Pacific Wave.